Rep. Steve Riley, R-Glasgow, (right) is congratulated by Senate President Pro Tem David Givens, R-Greensburg. Sen. Damon Thayer and Sen. Wil Schroder look on. 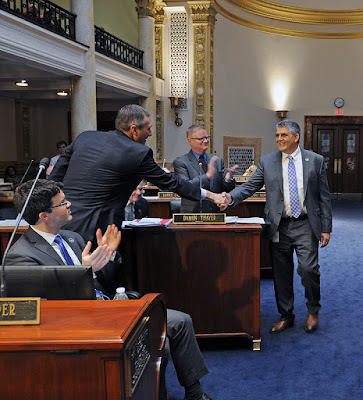 A bill that would give school districts more leeway in setting school calendars is on its way to the governor’s desk after passing the Kentucky House today. Senate Bill 50, sponsored by Senate Majority Leader Damon Thayer, R-Georgetown, would allow school districts to operate on a “variable student instructional year” that would offer the same 1,062 or more hours of instructional time that’s required for students under current rules. Districts that opt for the variable instructional year wouldn’t have to meet the state’s 170-day requirement for the school year, as long as students receive the number of hours’ worth of instruction that are proportionately equivalent to 170 school days. Districts could begin using the variable student instructional year with local board approval beginning with the 2018-2019 school year if their first day of instruction is on or after the Monday closest to Aug. 26. Rep. Brian Linder, R-Dry Ridge, who explained the bill before the House vote, said the variable option is “completely voluntary” and is designed to give school districts more flexibility. House Minority Whip Wilson Stone, D-Scottsville, was concerned that the bill limits school days to seven hours. “If districts don’t elect to extend their school day somehow, either at the beginning or the end of the day, then it would be very difficult for school districts to start the 26th of August and still not be going into June,” said Stone. The bill also would allow for creation of school district calendar committee (comprised of a school principal, office administrator, a school board member, parents of students in the district and a few others) that would recommend school calendar options to the local board. And it would require that the media be notified of school board meeting regarding the school calendar at least 24 hours in advance. SB 50 passed the House by a vote of 77-18. It was approved by the Senate on a 33-1 vote on Feb. 9.